It’s the 31st of October, and I’ve got something big on my mind – the final settlement of my birth home in Singapore, the flat my mother and aunt grew up in. But to the rest of the western world, it’s about something far more entertaining – Halloween. Australia isn’t real big on the Halloween shindig. Part of it is due to the Aussie aversion to anything they perceive as overtly American, and part of it just got left out of its immigrant DNA way back when British settlers arrived, all newly buttoned up and Victorianised. As to its origins, there is a little argy-bargy there too. Some say it was a pagan festival made Christian (like Christmas and Easter – which also have debatable origins, by the way). Others say both early Christian and pagan festivals co-existed before they got merged when Christianity moved through Europe. Mostly out of expediency, because both festival dates were so close. As Christianity moved through Europe it collided with indigenous pagan cultures and confronted established customs. Pagan holidays and festivals were so entrenched that new converts found them to be a stumbling block to their faith. To deal with the problem, the organized church would commonly move a distinctively Christian holiday to a spot on the calendar that would directly challenge a pagan holiday. The intent was to counter pagan influences and provide a Christian alternative. But most often the church only succeeded in “Christianizing” a pagan ritual—the ritual was still pagan, but mixed with Christian symbolism. That’s what happened to All Saints Eve—it was the original Halloween alternative! Arddun would have gone to school as Spider Pig. Because that would have been funnier. And I like funny. 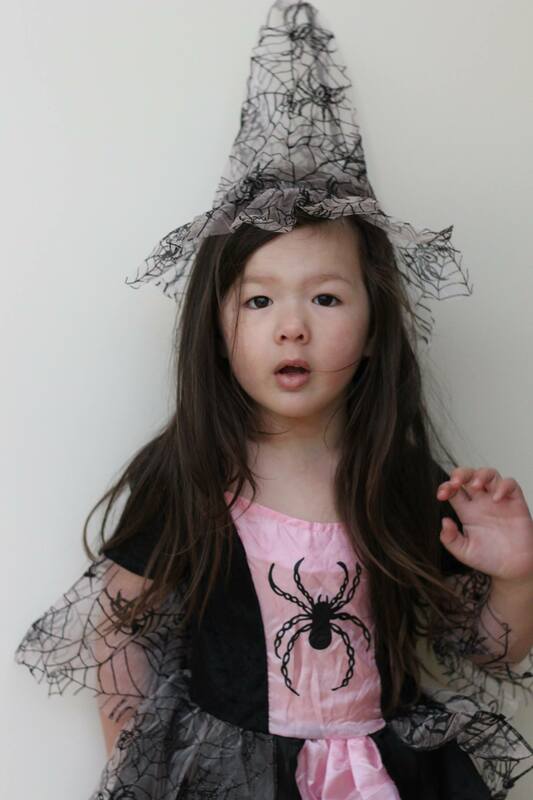 But today, she went to school as a pink spider witch. On Facebook today, I’m getting a weird mix of Halloween costume selfies and groupies, and a couple of rather upset feeds decrying this pagan festival and its growing encroachment into Australian culture. And while the former is largely to be expected and can be quite entertaining, it’s the latter types that are perplexing me. Because they seem to be saying – repeatedly – that as a Christian mother, I’m being spiritually remiss in allowing my daughter to participate in these festivities. I’ve thought about Halloween in passing through my Christian walk, and I’ve had at least three years to think about my convictions on the subject in earnest since I became a mother. So yes, the decision to get Arddun a Halloween costume was hardly a flippant one. The thing is, all of these are within the parents’ control – certainly in the very early years. As with anything, moderation and consistent teaching are required. Manners when approaching someone’s home. Stranger danger and safety. Values surrounding modesty while still maintaining fun. Arddun is not going trick-or-treating this year because I think she’s still too young to be exposed to that many lollies. But that’s a personal judgement call. I think it’s actually a wonderful way to foster neighbourliness, and she’d love it. And maybe we’ll do it next year. Except why limit that to just Halloween? Don’t we need to be vigilant at ALL times? In such an overwhelmingly secular society as Australia, the religious/pagan element of Halloween has been neutered by supermarket commercialism. And yet, think of other forms of literature we’ve exposed our children to. Ironically, the only times I’d encountered anything remotely resembling Deuteronomy 18 was when I did door-to-door evangelism in Singapore, and knocked on the doors of a few bomohs and Chinese mediums. Believe me folks, it wasn’t Halloween – it was broad daylight – and there were no scary costumes or candy. But my skin prickled and my hairs stood on end in a way I’d never experienced before. Nor ever want to again. My faith in Christ is my victory. In Him, there is no darkness and I am under His protection. If I honestly believe that – and I do – then I believe that I can cautiously and intelligently allow my daughter to enjoy this day of dress-up, just as I’ve allowed her to read about Hansel and Gretel, and pretend to be Elsa making a magic living snowman. All while still teaching her who God is. Also, here’s a really sensible take on Christian responsibility during Halloween.